A rose or a ladder? On the eve of Valentine's Day, a friend of my son persuades me to take my wife "out for dinner and buy her a nice gift". I thank her for the idea but do not ask her to hazard a guess on my choice. She is understandably horrified to hear that I had purchased an aluminium ladder to complement my wife's new bookshelf, and admonishes me, "You could have bought her a rose." I argue that an aluminium ladder is a more ethical gift than a corporate rose. I invite her to take a look at the politics of corporate roses, grown on leased farms in Asia and Africa. Within a few years, the land is ruined by excessive pesticide and fertilizer use--the only way in which roses can be cultivated, in keeping with demands of European and American markets. Corporate agriculturists move on from one poor farmer's land to another, after spoiling the first one. I suggest that she should examine the issue in the uk, where she lives, while I take a deeper look at 'the politics of aluminium' in Chhattisgarh, where I am to travel. We agree to exchange notes. I am travelling to my home district, where there is significant amount of bauxite mining; aluminium is its end product. Most inhabitants of Surguja district in Chhattisgarh are tribal. The region has large swathes of thick saal jungles, the land below which are rich with coal and bauxite. Lately, the forests have been dominated by Maoist guerrillas. "At least they listen to our grievances," one tribal tells me. A tribal lawyer among miners Ambikapur is the district headquarters of Surguja. Through a common friend there, I meet Indradev Nag who is a lawyer and trade union leader. A tribal lawyer is a rarity in this region. Nag is also associated with the Communist Party of India, a mainstream political party which is opposed to the guerrillas. He is more of a listener than talker, but slowly opens up. "The fight with the guerrillas is only a smokescreen behind which the administration is helping Hindalco run its mines," he says. Hindalco, India's biggest aluminium company in India, is owned by one of foremost business houses in the country: the Birlas. Nag says, "Hindalco signed an mou with the government that they will give permanent jobs to all who lose their land to the mines. But most mine workers, including those who lost their land, are casual labourers. And Hindalco uses police intimidation to stop trade union activity." A few days ago, he was accosted on his way back from a trip to the mines. A jeep bearing Hindalco's name had pulled up, and some policemen alighted from it. Their leader was a young man in plainclothes. He enquired about one Indradev Nag. "As soon as I responded, he started beating me. Had his deputy not snatched the pistol from him, he might have killed us. Then the deputy warned me not to come back to the area. We have complained but no case has been registered," Nag said. Hindalco is a reputed company and this was hard to believe. I decided to visit the company's mines. Journalist friends told me that the leader of the police team, who had attacked Nag, is a young man called Dheeraj Jaiswal. 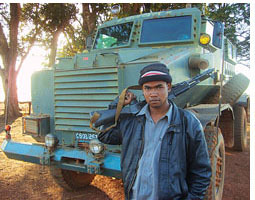 "Jaiswal is a local boy who joined the Maoists a few years ago. He has now changed sides. The police have caught key guerillas with Jaiswal's help. He uses his influence for other purposes too," they said. No journalist wants to accompany me when I want to meet Jaiswal. The road to Hindalco is one of the worst I have ever travelled by. I remember the mou had said that Hindalco would take care of the roads that would be damaged by its bauxite-laden trucks. It's my lucky day: I am permitted to visit the mines. Jaiswal is 'on patrol'. I am asked to meet him on my way back. Work is on at full swing at the Kudag mines. I request the person in charge to allow me to meet a labourer who has lost his land to the mines. The contractor of RK Jain and Co is surprisingly co-operative and introduces me to Seetaram Nagesia. The contractor tells me, "Nagesia was a Hindalco employee before but he works for us now." Coincidentally, it is Nagesia's farm which is being explored for bauxite that day. He points out: "You see that bulldozer digging there? That was my farm." We are soon surrounded by many labourers, most of whom have lost their land to Hindalco. Laxman Yadav, their leader tells. "I am among the only three supervisors left on Hindalco's payroll. The rest of the workers have been passed on to the contractor," he tells me. How could Hindalco not keep its word? I think of having a quiet chat with Nagesia to find out. Nagesia's small mud house is a bit away from the mines. He unrolls a mat for me to sit. His five daughters are playing nearby. "Most of our land has been taken away by Hindalco. The Rs 50,000 compensation went in paying moneylenders. We have to buy all our necessities--from rice to lentils to vegetables. Earlier, Hindalco used to give 2 litres of kerosene every month, they have stopped even that," says Nagesia. "I can't afford to send my daughters to school." I ask him to show me the Hindalco papers. He goes inside and comes back in few minutes with a plastic packet. According to the papers Nagesia is still a "regular fulltime employee" of Hindalco. So were Nag and Yadav lying? I start studying the papers carefully. Nagesia was indeed employed by Hindalco as a "regular unskilled labourer". His provident fund slip also showed Nagesia was an employee of Hindalco but his 'department' had been changed to RK Jain and Co. Until 2000, his department was the Samripat Bauxite Mines. So was R K Jain the name of a Hindalco department? "No," I am told, "That is the name of the contractor." A study of amounts deposited by the company to Nagesia's provident fund account is also revealing. Hindalco had deposited Rs 302 and Rs 352 during the first two years of his service. But since Nagesia's department had changed, the company's contribution has fallen to Rs 187 and Rs 192 in the past two years. Provident fund contributions are in proportion to salary, so Nagesia's salary had been halved. "How come?" I ask him. Nagesia tries to explain, "When there is no work, we do not get paid. Earlier, we had to break a tonne of bauxite stones to make a day's wage. Now, we need to break three to four tonnes." We return to the mines, where Laxman Yadav chips in with more information. "Of the 60 from Kudag who got jobs after losing their land, 10 have decided to quit." He tells me, "In Hindalco mines in nearby states, people doing similar work get double the wages we get. But we are paid less because we are not organized. We want to form a union but are afraid of the police." Yadav takes me to the site of a Hindalco office half a kilometre away--it was blown up by Maoists two years ago. Debris from the old Hindalco office is still scattered. Burnt trucks lie there. Hindalco officials were spared by the Maoists during the attack. They had since moved their office to Kusmi. The labourers want to "show me more". But I have been advised to be back in Ambikapur before dark so I return, via Samri. At the heavily protected Samri Police Station, one can't miss two vehicles standing side by side, in service of the police force--an anti-land mine vehicle, and a truck emblazoned with Hindalco's name. Jaiswal is 'waiting' for me. He is very polite and tells me, "Though my age is 22 officially, I am 18 years old and have no official status with the police. But I have been in charge of this police station since January 7, 2006." He asks me about my trip to the mines and says, "I hate Hindalco. They are looting this area. They don't give good jobs to locals. All their skilled workers are outsiders. Don't we have skilled workers here?" I decide not to ask tricky questions. Back at Ambikapur, I meet Ashok Sharma of the Deshbandhu newspaper. "We have published a report recently saying that Hindalco has grabbed 2.8 hectares from one Munshiram in Kudag without compensating him. Hindalco has also not paid the family members of many who have lost their lives in the mines. It has not given jobs to people who have lost their land to the mines. Our reporters are afraid of travelling in that area. We got this information from a local tribal leader," Sharma says. Is it only Hindalco or is the whole aluminium industry exploitative? I am now keen to visit the bauxite mines of another company, Vedanta, located nearby. Vedanta, a uk -based company, is also known by its old names: Balco, and Sterlite. It also has an aluminium smelter nearby, bought from the government some years back. I start for Manipat where Vedanta has its bauxite mines, next morning. Manipat is a hill station. The villages on the way are picturesque. The people there tell me, "Temperatures are rising here since mining started. If tree felling continues at this rate, this may soon stop being a cool place. We also fear that streams originating in the hills may dry because of blasting in the mines." 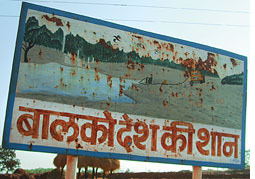 Big hoardings proclaiming 'Balco, Pride of the Nation' welcome visitors to the mining area. As soon as we cross the market we come across some tiny mud and stone dwellings, which we are told are homes of Balco mine employees. The workers are already at the mines. I meet Savitribai, who tells me, "We came from the plains. My husband has been working in the Balco mines for the past 11 years. He earns around Rs 2,500 a month." 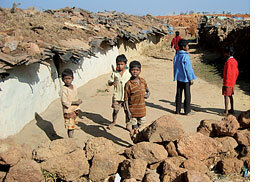 The condition of the settlement is similar to the slums of any Indian city. The children playing around have not bathed for days. In the mines, I meet an agitated Shivkumari of Kudaridih village. She and her husband Mohandas tell me, "Look at these bulldozers. Our land is being dug but we have not been compensated." Kudaridih must once have been a large village with big houses. A few standing houses, and old trees, testify to that. "More than 100 people have lost land to Balco, here" explains Laxman Yadav, a mine labourer. "But only 50 got compensation. The rest have been told that their land is not in official records. We have been tilling these lands for generations. Some of us even have deeds but officials don't accept them." Laxman Yadav takes me to see the land where his house once stood. "I got Rs 50,000 as compensation for my two hectares. In 1992, they demolished my house in the middle of a rainstorm and bulldozed my standing crop. The land that supported generations of my family is all gone now. I live in a rented house." I try to meet Balco's press relations officer, Deepak Pachpore, but he is 'busy'. I also want to know about the case pending in the supreme court, alleging "the illegal capture of 450 ha by a Balco smelter in Korba, and the illegal cutting down of more than 50,000 trees". Now back in Delhi, where I live, I am waiting for the Hindalco and Balco officials' response to my findings. I also visit the Basti Harfool Singh area near the Sadar Police Station -- Delhi's metal market. Traders there tell me, "Hindalco is the best. Their aluminium ingot is very good quality." One of them, Vinod Loomba, says, "The British left India many years ago but they still control our lives through the London Metal Exchange, which determines the rates of all the metals here." The Sadar Bazar traders give me addresses of aluminium extrusion factories in Uttar Pradesh's Sahibabad area, where aluminium ladders are made. I hear stories of violation of labour rights in these factories. I also contact Babu P Remesh of the V V Giri National Labour Institute, Lucknow, who has recently conducted a study, 'Impact of privatisation on labour: a study of Balco disinvestment'. The study concludes, "The quality of life has deteriorated for Balco workers in the past five years. Many voluntary retirements were coerced." When Nagesia, a 'full time permanent employee' of Hindalco, told me that he couldn't afford to send his children to school, I did not have the heart to tell him that his employer had recently bought an American/Canadian company, Novelis, for about us $6 billion, making Hindalco the world's fifth largest aluminium company. I also could not tell him how proud we urban Indians are of the fact that every can of Coca-Cola manufactured worldwide has an Indian (Hindalco) connection, thanks to that famous merger. But at least now I can write to my son's friend accepting defeat, and promising to buy a more romantic gift for my wife next Valentine's Day. An aluminium ladder is no better than a corporate rose.